Nuanced and poignant, heartrending and funny, Michelle Theall’s thoughtful memoir is a universal story about our quest for unconditional love from our parents, our children, and most importantly, from ourselves. Nuanced and poignant, heartrending and funny, Michelle Theall’s thoughtful memoir is a universal story about our quest for unconditional love from our parents, our children, and most important, from ourselves. Even when society, friends, the legal system, and the Pope himself swing toward acceptance of the once unacceptable, Michelle Theall still waits for the one blessing that has always mattered to her the most: her mother’s. Michelle grew up in the conservative Texas Bible Belt, bullied by her classmates and abandoned by her evangelical best friend before she’d ever even held a girl’s hand. She was often at odds with her volatile, overly dramatic, and depressed mother, who had strict ideas about how girls should act. Yet they both clung tightly to their devout Catholic faith—the unifying grace that all but shattered their relationship when Michelle finally admitted she was gay. Years later at age forty-two, Michelle has made delicate peace with her mother and is living her life openly with her partner of ten years and their adopted son in the liberal haven of Boulder, Colorado. But when her four-year-old’s Catholic school decides to expel all children of gay parents, Michelle tiptoes into a controversy that exposes her to long-buried shame, which leads to a public battle with the Church and a private one with her parents. In the end she realizes that in order to be a good mother, she may have to be a bad daughter. Michelle Theall is an award-winning health, fitness, and travel writer and the founder of Women’s Adventure magazine. Her feature essay in 5280, the inspiration for her memoir, was nominated for a GLAAD Media Award. She lives with her partner, their son, and three dogs, in Boulder, Colorado. Visit MichelleTheall.com. "Teaching the Cat to Sit is a powerful reminder of the ways that discrimination and cruelty still flourish, even as laws shift to recognize more of the LGBT population. Michelle Theall beautifully captures the effects of bigotry on a community, a family, and on an individual psyche both afraid and determined to change." 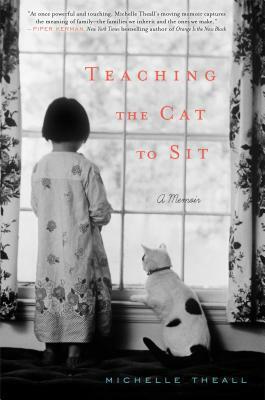 "Michelle Theall’s memoir Teaching The Cat To Sit is all heart--painfully and beautifully so--with a moving message about how powerful a mother and church can be--for better or for worse." Michelle Theall has written a clear-eyed, brave-hearted and utterly unforgettable memoir about life’s big things—love, faith, identity, and justice—and the sometimes-ferocious effort it takes to balance them. At this book’s center is a beautifully rendered relationship between a mother and daughter that’s as complicated and memorable as any I’ve ever read. Here is a story told with grace, honesty, and remarkable spirit. Michelle Theall tells the story of learning to fight for her truth and the journey is engaging and evocative. Teaching the Cat to Sit is life under the microscope—a struggling family, the rigid church, the mean kids at school, and the coaches who took the time to care. It’s an emotional ride as this mama bear finds home. Powerful down to the last page. This book shows the resilience of its author and the universal quest to belong at all costs.